Home » Online Exhibits » Penn People » Penn People A-Z » William Thomas Hobson, Jr.
Wilson Thomas Hobson, Jr., was born in Philadelphia, Pennsylvania, on August 26th, 1902. After graduating from Philadelphia’s Germantown Academy he entered the University of Pennsylvania in 1920. As a Penn student, Hobson was captain of the soccer team that won four straight intercollegiate championships. Hobson was a member of Phi Delta Theta fraternity and of the editorial board of the Daily Pennsylvanian. He also served as secretary of his senior class before graduating in 1924 with a B.S. in Economics. After graduation Hobson was associated with the Retail Credit Company while training to become a member of the U.S. Field Hockey Team. As a member of this team, he earned a bronze medal at the 1932 Olympics in Los Angeles. 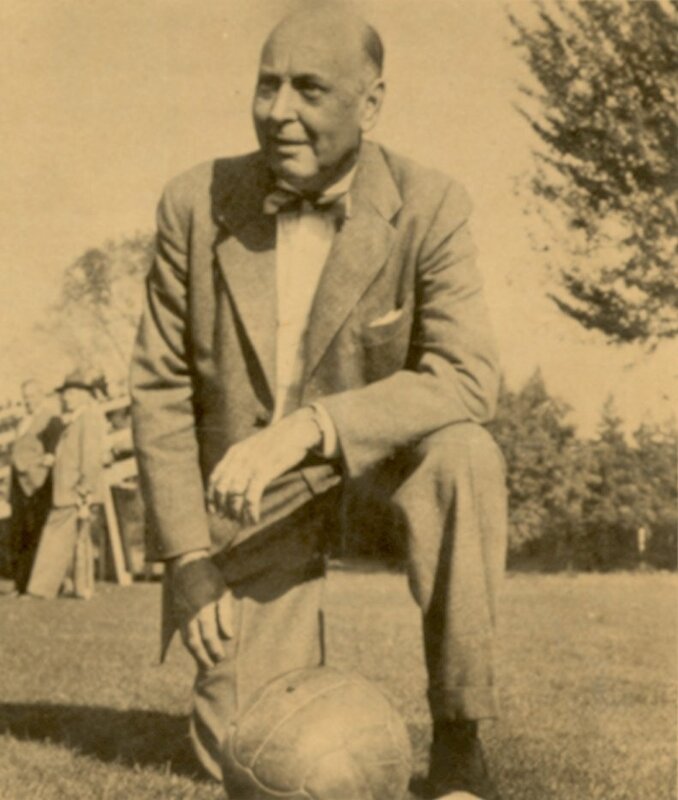 When he and his other teammates, including James Gentle, lost all their games at the 1936 Berlin Olympics, Hobson decided to concentrate once again on soccer rather than field hockey. Hobson went on to serve as an official in many state, national, and international soccer associations and as the manager of the U.S. soccer team that played in the 1956 Olympics in Melbourne, Australia. He later went with the team on a State Department-sponsored goodwill tour of Japan, Korea, Indonesia, Hong Kong, and the Fiji Islands. In 1942 Hobson was called to active duty in the Navy where he served as a gunnery officer in the Atlantic, Pacific, and Mediterranean during World War II. The war did not prevent him from playing competitive soccer; he retired from active play in 1948 when he realized he couldn’t physically keep up anymore. After the war he served in the U.S. Naval Reserve and retired with the rank of commander. In later life Hobson worked as traffic controller for the Butterworth Manufacturing Co., a textile machinery maker in Bethayres. He was a member of the Philadelphia Cricket Club and coached its soccer team for many years. He also served on the U.S. Olympic Committee and was secretary-treasurer for the U.S. Soccer Football Association for 25 years and for the Middle Atlantic Intercollegiate College League for many years as well. Hobson either played in or attended every Olympic Games from his college graduation until 1968; his involvement in the Olympics continued until his retirement from sports in 1972. He died three years later on July 1, 1975.